Don’t you love using an Advent calendar at Christmas to countdown to the big day? 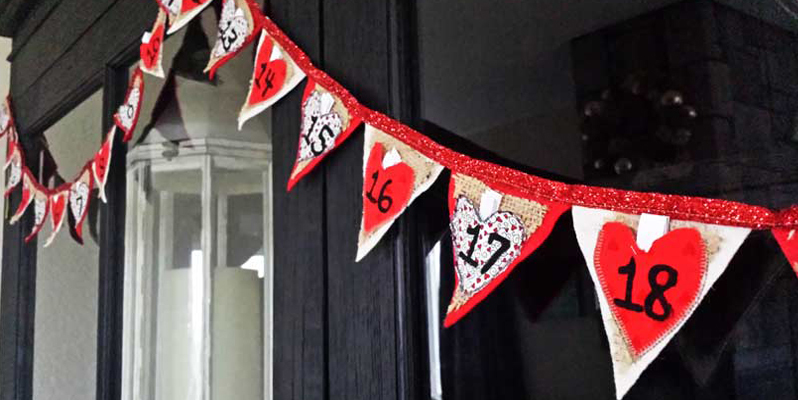 This fun DIY Valentine’s Day Countdown Banner has the same premise–except it includes simple and fun activities about love that you family can do every day during February! And because this love-inspired banner is made of fabric, you can use it year-after-year as part of your family’s Valentine’s Day decor! Put a sweet treat (a Hershey’s Kiss, for example) in each day’s heart pocket. Hide a piece of paper with a scripture or thought about love in each day’s pocket. Write some sort of small activity about love to do each day. Or, use this with a spouse or significant other as a way to tell them, each day in February, how much he/she is loved (maybe you could leave little love sentiments in the odd numbered days, and he could leave them in the even-numbered days). Even if you can’t do every day of the month, it’s still a really fun Valentine’s family activity that your kids will love! Let’s get you the instructions! I can’t wait to show you how easy this is!